At the Fence: Hershey's Cookies n' Creme Cereal Prize Pack! I have a really GREAT review/giveaway coming up for you. It is a Hershey's Cookies n' Creme Cereal Prize Pack. My family is so enjoying this one. 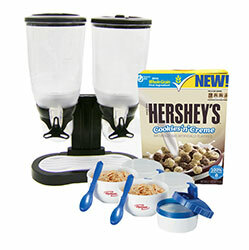 We received a box of General Mill's Hershey's Cookies n' Creme Cereal, a double cereal dispenser, and two cereal to go bowls. This is perfect for my family. Give my children just about anything chocolate flavored and they are happy! Not to mention it is Hershey's! I had to restrain them from having a bowl the day the package arrived. They actually had to wait until the next morning. Needless to say, it went fast! Now, I on the other hand really like the dispenser. I am so tired of having opened boxes of cereal sit around. Now I can just fill the dispenser with two cereals and tell them we will not open another until the container is empty. The containers are easy to use and you just hold your bowl under the opening and spin the knob to dispense your cereal. The last item is a cereal to go bowl. It is pretty unique! The top part of the bowl has non-toxic freezer gel in it. You freeze the top portion and then fill the it with milk and place in the top of your cereal bowl. You put your cereal in the bowl, snap on the lid and you are ready to go. It even comes with a foldable spoon. Pretty neat! Anyway, our main focus is on the cereal. 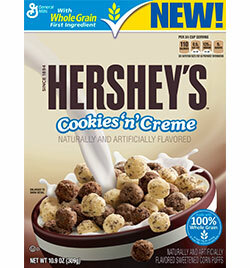 Now you can enjoy the delicious taste of Hershey´s Cookies ‘n’ Creme in a breakfast cereal from Big G. With an irresistible taste the whole family will love from a brand you trust, new Hershey´s Cookies ‘n’ Creme cereal is made from 100% whole grains with at least 14g of whole grain per serving (at least 48g recommended daily). Best of all, Hershey´s Cookies ‘n’ Creme cereal has only 9 grams of sugar per serving and is a good source of Calcium, Vitamin D, and 10 other essential vitamins and minerals. As I said, ours went fast! Of course with 6 children and a husband, it would! 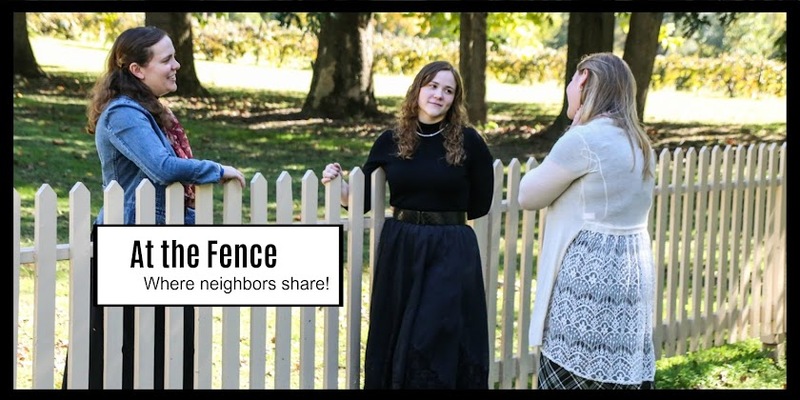 The really good news is that a neighbor At the Fence will also receive one of these GREAT Prize Packs from General Mills and My Blog Spark. Disclosure:I received no monetary compensation for this post. I did receive product for review purposes from General Mills and My Blog Spark. All quotes in red are taken from the sponsor's email or website. All thoughts and opinions are my own. I would use it for my son's breakfast! We travel a lot for business & pleasure so I would use this pack (those bowls) for when we travel or at our vacation condo. I'd use this as a sort of breakfast/snack bar when the family visits. I love the cereal dispenser. It would make breakfast fun. This would be a dream come true for my son! He loves all things cookies and cream-especially the candy bar from Hersheys! This is a great prize pack and I know he would use it everyday!! Especially since he is leaving for college in September-this would be a great addition to his student apartment! How about feeding step sons who eat astonishing amounts of food (the dears!) they would like that cereal dispenser. We would use this prize pack as you did. Put the cereal in the dispenser, pour it into the portable bowl and eat it! I love the dispenser idea so I'd definitely use that to keep our cereal more organized and less messy. I'm tired of open cereal boxes too! I would put it on my counter so the little ones can learn to fix themselves a bowl. This is awesome! I go camping a lot and this would be so much fun at the camper, as we always out running around! Thanks for the chance! I would love to have the dispenser! My family seems incapable of closing the cereal bag/box and the cereal gets stale. I especially like the cereal dispenser. I would put the dispencer on the counter and my kids could actually use it without help. Yea! The cereal looks delicious and would double as a snack even without milk. I would usee it on the counter to keep tthings nice and tidy! I lovethe dispenser. What a great item to have with kids. I would absolutely love this to put our cereal in to clean up some cabinet space! It looks neat too, and would be fun for the kids to get there own cereal! I think this would be great for sleepovers. I would use it for my daughter's breakfast! I would use it for breakfast. We go through a ton of cereal. My child would love it. We'd use it at home. Hershey's cookie and cream candy is my favorite candy, so I would love to try the cereal. Also, I would love the dispenser because I am tired of finding spilled cereal all over my tables and counters! lol Thank you for the wonderful giveaway! The dispensers will be very helpful for my family! My boys love trying to pour their cereal themselves but in the end there usually is a mess. I would definitely sit them on my counters and they can use them in the mornings! I'd use the dispensers right on my kitchen counters! No more spilled cereal from overzealous pourers! Perfect for the counter and it would keep your cereal fresh! I'd like to try the cereal and see if my family likes the flavor of it. As for the cereal dispenser, I'd use it to put cereals in and my kids could get their breakfast from there when they wake up. Thanks. I think my kids would love this cereal and they would love to win so that they could use the cool cereal dispenser. My grandchildren would love the cereal in this! I would use it for my granddaughters. They all love cereal. The cereal dispenser would be great to have. For some reason, when in boxes, cereal always ends up on the floor.